Engineer Dirar Abu Sisi - allegedly abducted abroad - developed and improved missiles for use against Israel. Dirar Abu Sisi, the Gazan engineer held by Israel after allegedly being abducted by Israeli agents abroad, has been charged with activity in a terrorist organization, hundreds of counts of attempted murder, conspiracy to commit murder and production of weaponry. The Southern District Attorney's Office submitted to the Be'er Sheva District Court on Monday an indictment against Abu Sisi, who it said is a Hamas official. 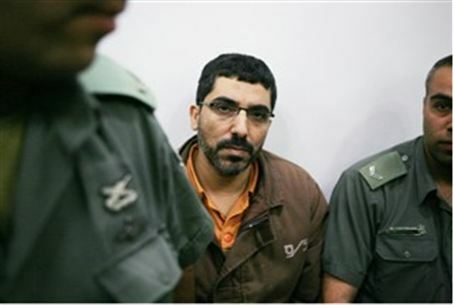 According to the indictment, beginning in 2002, Abu Sisi was engaged in the development of missiles to be launched by Hamas into the State of Israel, including increasing their range and ability to pierce steel so as to penetrate IDF armored vehicles and thus strike at soldiers. Abu Sisi also administered the Hamas military academy, which was established following Operation Cast Lead as part of Hamas's lessons from the war. Abu Sisi is accused of nine charges regarding activity in a terrorist organization, hundreds of counts of attempted murder, conspiracy to commit murder and production of weaponry offenses. According to the indictment, Abu Sisi received his doctorate at the Kharkov Military Engineering Academy in Kharkov, Ukraine, and studied under Prof. Konstantin Petrovich, an expert in SCUD missile control systems. During his studies, Abu Sisi acquired extensive knowledge in missile development, control systems, propulsion and stabilization. Simultaneously with his work as an engineer for the Gaza electric company, Abu Sisi secretly joined Hamas. Between 2002 and 2008, Abu Sisi held an administrative role in Hamas, with responsibility for electricity in a committee headed by senior Hamas terrorist Muhammad Deif, which was engaged in developing and improving missiles and mortars of various types. Abu Sisi's activity led to the development of deadly missiles that were launched beginning in 2002, and which are still being launched at the State of Israel and at IDF armored vehicles, thus harming the security of residents of the State and IDF soldiers on a daily basis. Following Operation Cast Lead, Abu Sisi was appointed to direct the establishment of a military academy that would train Hamas officers and commanders for combat. He did in fact establish this academy. Abu Sisi is charged with multiple counts of attempted murder because he was party to hundreds of attempts to cause the death of residents of the State of Israel and IDF soldiers. The charges of offenses of criminal conspiracy stem from his manufacture and development of missiles of various types, and his firing of missiles at the State of Israel. There had been speculation that Abu Sisi was abducted because he had information about the location of abducted soldier Gilad Shalit. His sister claimed that he was abducted because he had enabled the Gaza power station to run on Egyptian fuel rather than Israeli fuel. The indictment was filed by Moran Gaz from the Southern District Attorney's Office.